I wasn't quite sure if I wanted to participate in the Blogger's Quilt Festival because my blog has been so neglected lately. I started out 2016 planning to participate in the Finish-Along all year, but in February we started the process of deciding and then buying a home and that took up a lot of my time and energy (such an understatement) for 4 or 5 months. We have been in the new (to us) house for almost 3 months, school has started, and things are calming down. I decided to go ahead and post about my tone-it-down quilt for my BQF entry, in the Large Quilts category. I finished this just about a year ago and it is still one of my favorite quilts. It's on my daughter's bed and I still think about making another one. As soon as I clear out my WIP pile somewhat. I think this pattern would look really good with a background of just 5 or 6 subtle variations of off white, or pale pink. *Pattern is from American Patchwork and Quilting and was the quiltalong pattern for 2014. Search #apqquiltalong to see more. 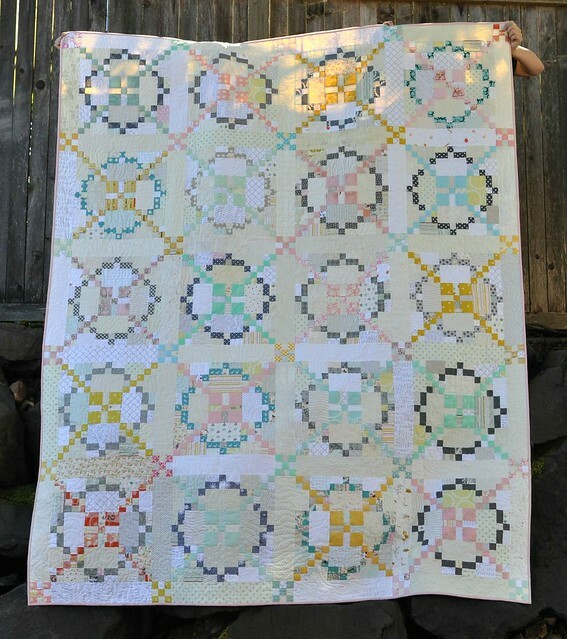 *My color choices were inspired by this quilt by Svetlana/SOTAK Handmade. 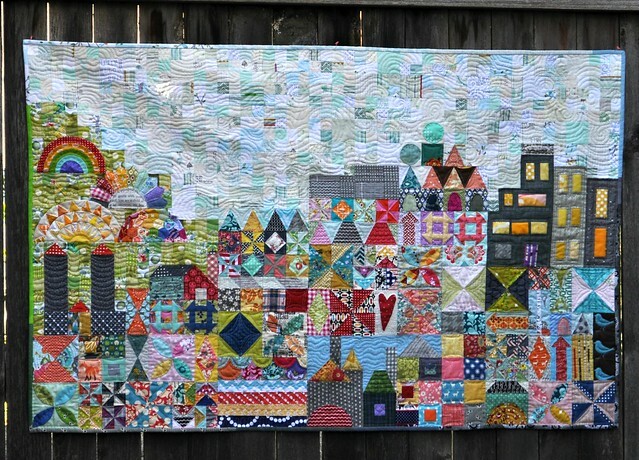 Many thanks to Amy for hosting the Blogger's Quilt Festival! Please go visit the festival and check out all the amazing work quilters have been sharing this time around. During the first quarter of the year, I finished two projects on my finish-along list--the purple and gold jellyroll race quilt, and the My Small World quilt. Three of these were also on my Q1 list. Clockwise from the top left they are my scrappy pillow, Alabama Chanin skirt, my Weekender bag, and disappearing 9-patch quilt. The Weekender has been intimidating me for a while, and I need to just do it. I need to buy cord for the piping, the zipper, and a solid fabric for the handles and maybe the bottom panel of the bag. I have been wanting to make a Sew Together bag but feeling like I ought to finish this Weekender first. I can do it! I started this quilt back in September. 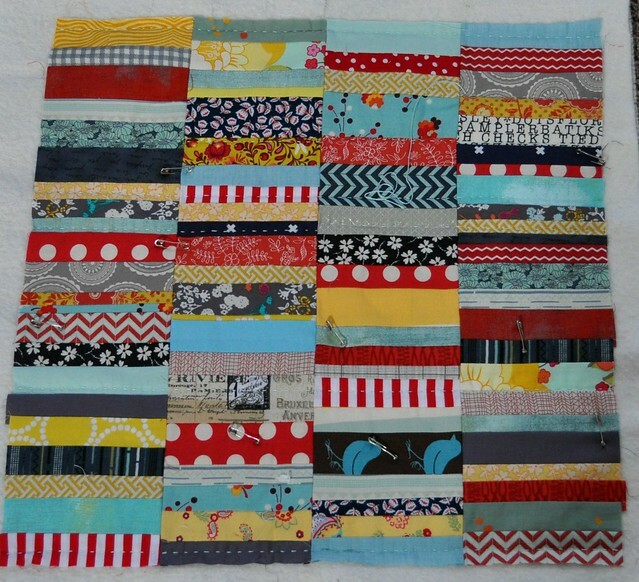 I got the idea for the scrappy blocks from Lynn at K&S Design Girls. I'm planning on making 25 of the 12" maple blocks and alternating them checkerboard style with off-white blocks. With a few small leaves for fun. 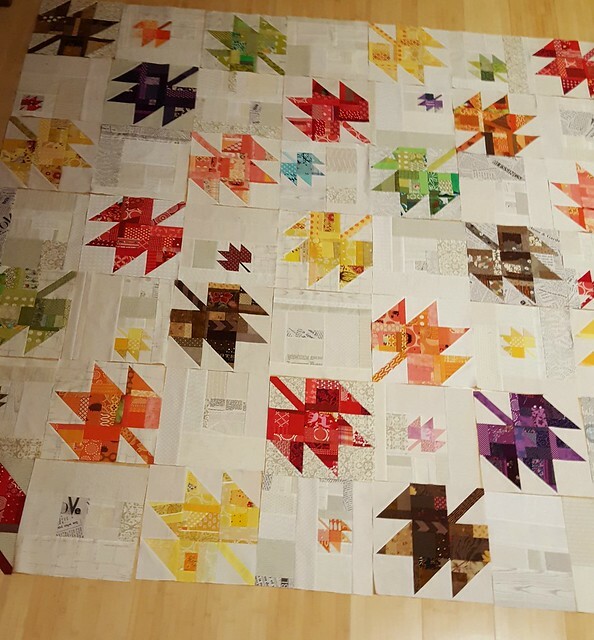 I have 16 of the leaf blocks done and hope to finish the remaining 9 and most of the background blocks by the end of June. 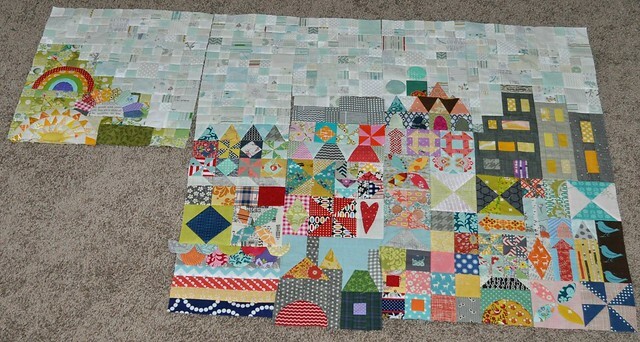 I'm also continuing to work on my hand pieced trip around the world quilt top. Hopefully I will blog about some of these projects over the next few weeks as I get things done! 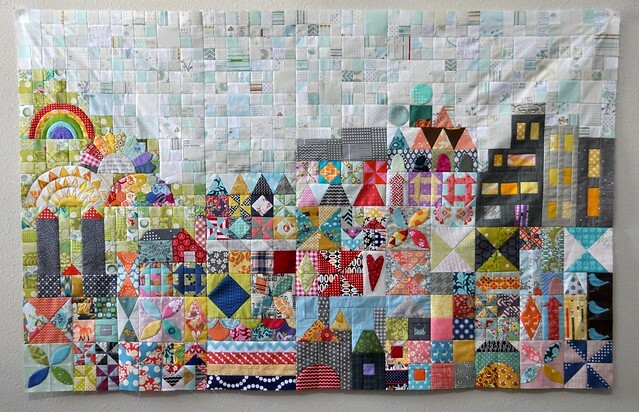 My Small World--quilt pattern by Jen Kingwell, this one made and quilted by me. 53"x33". This was a big project. I started sewing it in May 2015 and finished it earlier this week. I kept track of my quilting time--8 hours and 25 minutes of machine quilting, and 95 minutes of hand quilting. The orange peel blocks and the two appliqued circles in section 2 are the only parts that I hand quilted. The back of the quilt is made of mostly fat eighths of a Momo fabric bundle I bought a while back. Overall, I'm happy with it. I'm also tired of it and maybe will be more enthusiastic about it after some time not working on it or having it in my list of ongoing projects. There are a few places where I don't love my fabric choices and also a couple parts of the quilting that didn't come out as well as I'd hoped. But. I love a lot about it. I like the sky and the green background on the left side. I love how section 5 turned out. (All rainbows and sunny with the hexagons, dresden block, rainbow, and New York Beauty.) I'm very happy with almost all of the machine quilting. I feel like I learned and improved my needle turned applique skills. 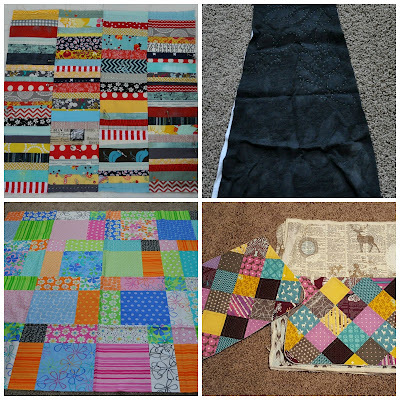 And I improved my fabric selection over time as I made the different sections of the quilt. Scale and value are really important when working on such small pieces. Just so you know, the only place where I didn't follow the pattern is the 4"x2" heart in section 2. I made that heart back in the year 2001 when I was just a baby quilter. It was an extra leftover from my flag/star mini quilt, which was probably my first mini quilt ever. Most of the binding pieces are from my binding scrap rolls. I cut 2 new pieces for binding the sky section. I'm so happy to have this quilt done, and I'm planning on getting it up on my front room wall really soon. 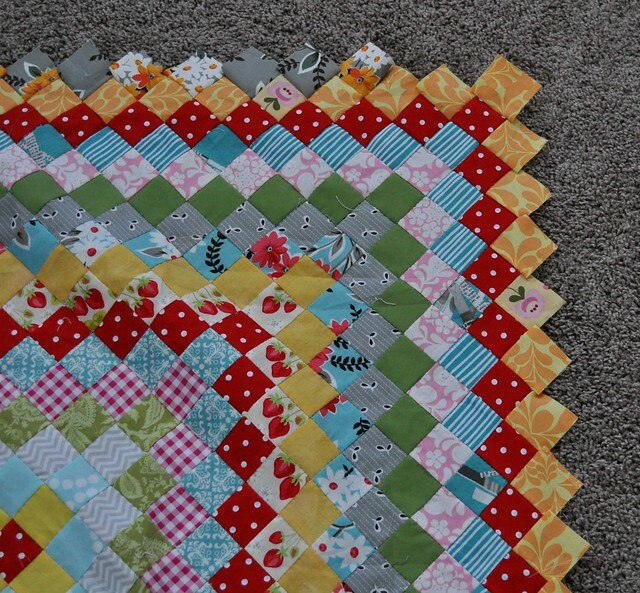 This quilt is one of two items I completed from my Q1 Finish-Along blog post. It feels good to get long term projects finished! I finished my My Small World quilt top! I started this project back in May last year. It's been fun to work on, and challenging. Choosing colors and making the applique portions in part 5 have been the hardest parts. There are a few color/fabric choices I don't really love, but overall I am really happy to be to this part of the project. A few tips for anybody thinking of making this quilt: follow along with the hashtag on Instagram--#mysmallworldqal and/or #mysmallworldqal2. There are people there who have done blog posts with details for completing each section. Sarah at Sew What, Sherlock, has free paper piecing templates she'll pass on if you send her a ransom photo of you with the pattern. I don't know how it's even possible to do the New York Beauty block in section 5 without them, so thank you, Sarah! 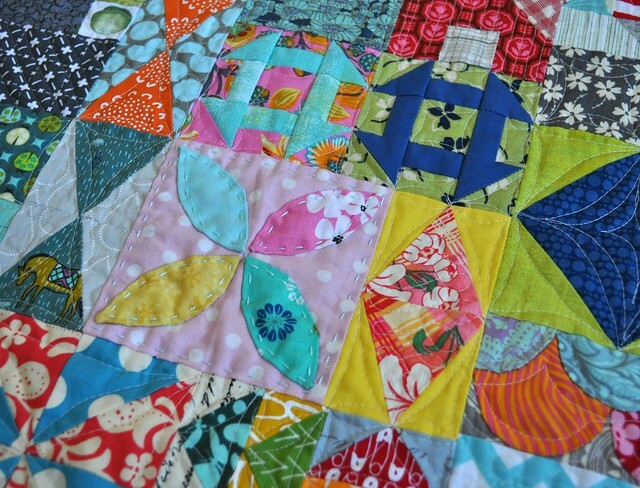 I made the pinwheels, quarter-square triangles, churn dashes, and flying geese using traditional piecing methods and good old quilt math, rather than make templates for every size of square, rectangle, or triangle. 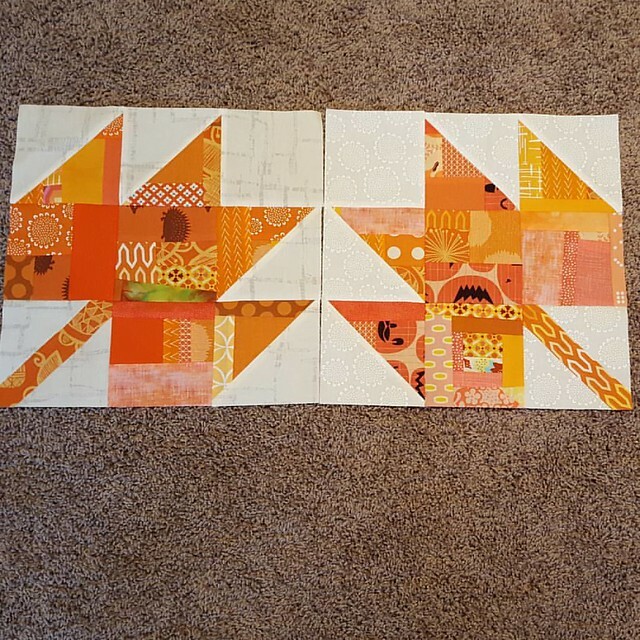 I did use the pattern templates for the hourglass rectangle/triangle blocks, the orange peel applique blocks, the circles, the rainbow, the Dresden, the little doors, and the scallops. I found a website and printed my own 1/2" hexagons on cardstock. When I appliqued the hexagon section to the background, I used a water soluble marker to draw the semicircle pattern onto my pieced hexie chunk, then pinned it in place. I turned the edges under as I sewed it to the background, and then cut out the backing behind it and trimmed the bulky hexagon excess. I had thought about staystitching and trimming it before appliqueing it, but the way it did it worked ok.
Pattern info: the pattern is by Jen Kingwell and is available here. The finished quilt top is around 33" x 53". I'm taking a little break from this project but soon I'll be figuring out the back and getting it ready to quilt. If anyone has any questions I'd be happy to answer in the comments. A few weeks ago I counted up my UFOs, quilting and otherwise, and the number is bigger than I'd like it to be. So I decided to participate in the Finish Along that's been going on for the past few years. I don't think I've blogged about this project at all. I started it last May as part of the quiltalong on instagram. #mysmallworldqal is the hashtag. I need to finish piecing part 6 and applique one more section onto part 5. Then baste, quilt, bind. This is based on a tutorial by Amanda Jean, with some changes. Needs more hand quilting, maybe some machine quilting too to speed things up. And then to be made into a pillow cover. I started this way too long ago. Maybe close to three years ago. 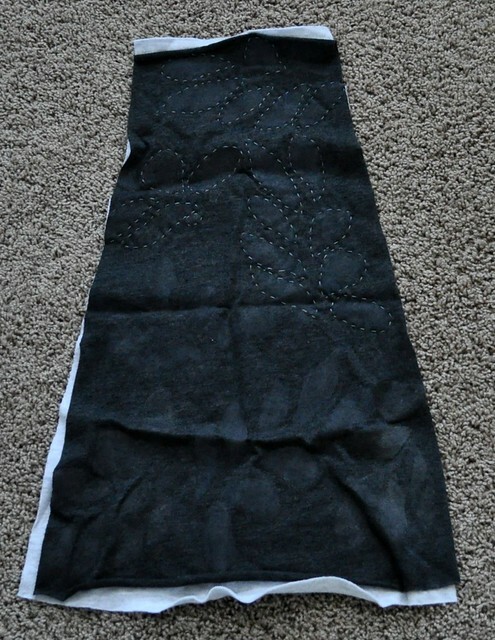 I think part of the reason I haven't finished it is I'm apprehensive about how it will fit and/or look on me. I need to just get it done, it is so close. I think it will turn out better than how I've been worrying it will be. I need to finish the stitching and cutting on this panel, and then sew the 4 panels together and attach the elastic. I made this quilt top from a layer cake along with my sister-in-law and the kids a while back. It's going to be donated, probably to the children's hospital. I'm waiting for batting to arrive, then it needs to be basted, quilted, bound. 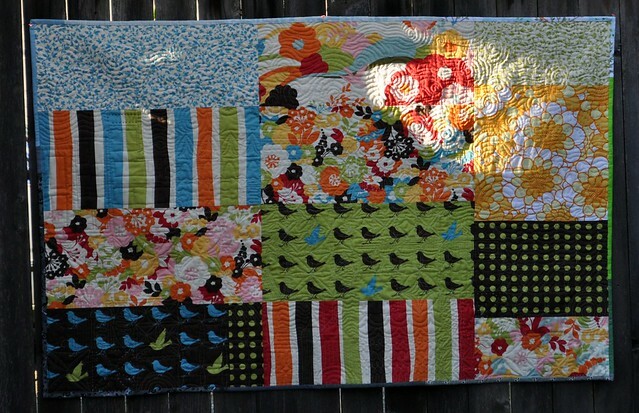 Jelly roll race quilt Also for the children's hospital. This is not really my style--I got the kit during the year I was a member of a traditional quilt guild here. Needs to be basted, quilted, and bound. Finally, this won't count for the finish-along, but I also want to complete 6 more rounds on my hand-pieced Trip Around the World quilt. And I'm also going to make some more x+ blocks. 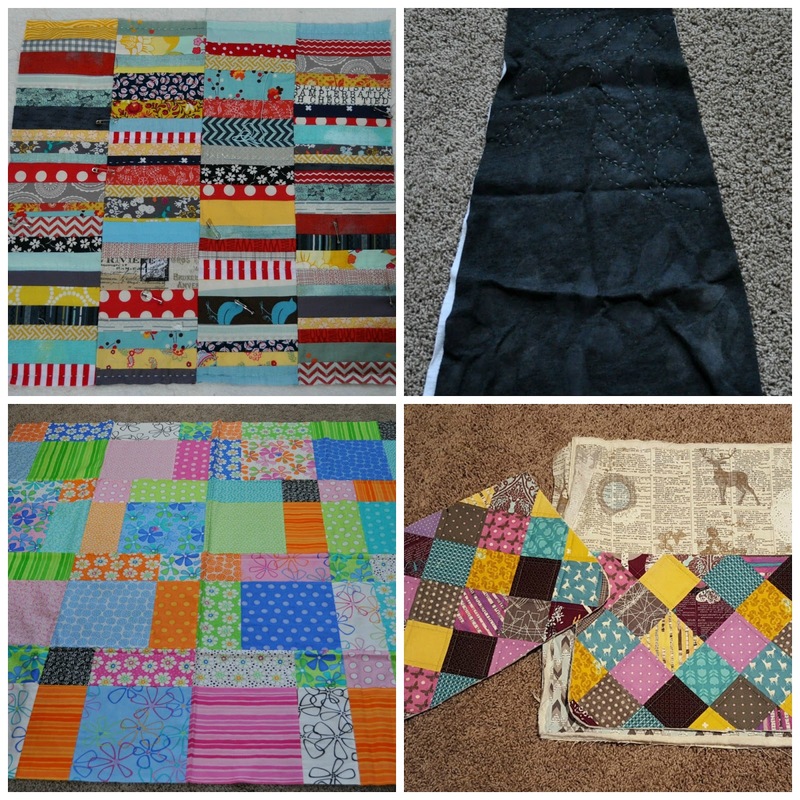 I'm linking up at A Quilter's Table, and looking forward to finishing lots of projects in 2016!